Many seem to trip up on the requirements for this simple yet mandatory safety equipment. 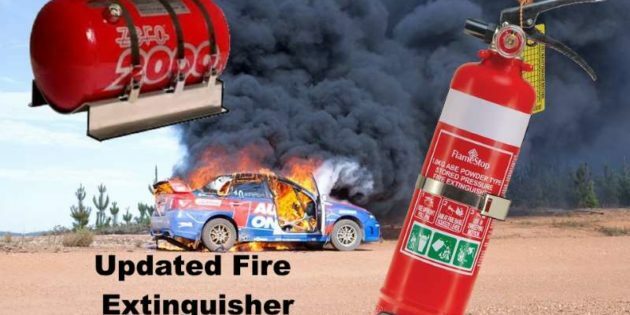 Let’s take a look at the 2019 fire extinguisher rules for motorsport. How often does a fire extinguisher need testing? The straight answer is every three years. This is determined by the date stamped into the neck or base of the body. It sometimes take a bit of squinting to see the date! 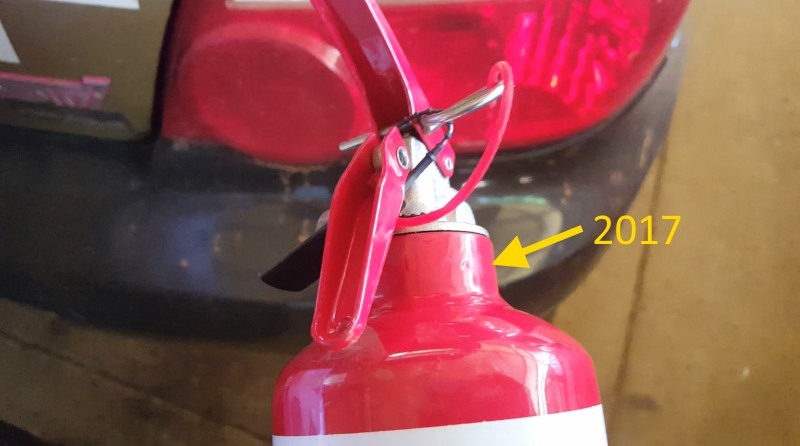 If your unit(s) has been; manufactured within the last three years, is undamaged and fully charged, it should comply with the 2019 fire extinguisher rules. No tags are required for motorsport any more. Why? Motorsport authorities discovered that many competitors were modifying their own tags and scrutineering wasn’t always thorough enough. Under the 2019 fire extinguisher rules scrutineers are required to remove the units for inspection. A physical date check has therefore removed the need for tags. In an accident that last thing anyone wants is a fire extinguisher loose and flying around the cabin. Therefore all extinguishers must have a metal bracket that securely holds the unit. The brackets must be fixed with high tensile bolts capable of withstanding the force of an impact. We use M6 button/mushroom head zinc plated high tensile bolts with flat washers and nylock nuts underneath. New in the 2019 fire extinguisher rules is an addition regarding access. In the past you could have bolted your unit in the boot and still complied with the rules. Now the rules say that the unit(s) must be fixed in an easily accessible position when seated. We usually bolt fire extinguishers to the floor in front of the driver and co-driver seats. How often should I service my extinguisher? 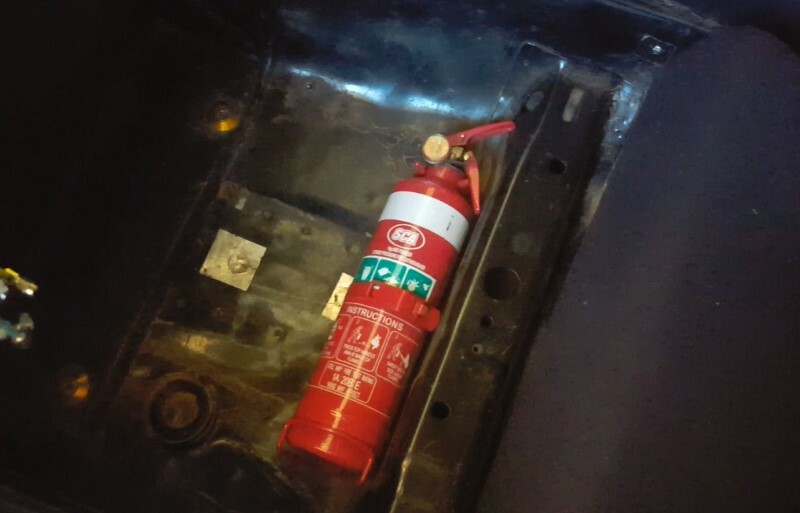 Every few months it is a good idea to remove your extinguisher(s) from the vehicle. Give them a good shake or gently tap them with a rubber mallet. The idea is to loosen up the powder inside so that it does not settle and compact. You can do this yourself without the need for a professional service. Khanacross – 1 x 1kg unit meeting Australian Standard and above rules. Autocross – 1 x 1kg unit meeting Australian Standard and above rules. Rally Sprint – 1 x 1kg unit meeting Australian Standard and above rules. NB: These are the minimum requirements. You can of course fit more than one extinguisher. Once you step up to full rally the 2019 fire extinguisher rules are slightly different. Mounting and testing requirements are the same as above. The difference is you need to have a minimum of 2kg rather than 1 kg. The easiest way to meet the requirement is to have 2 x 1kg fire extinguishers bolted in the vehicle. In addition to the hand held extinguishers, rally vehicles may also need a plumbed in system. 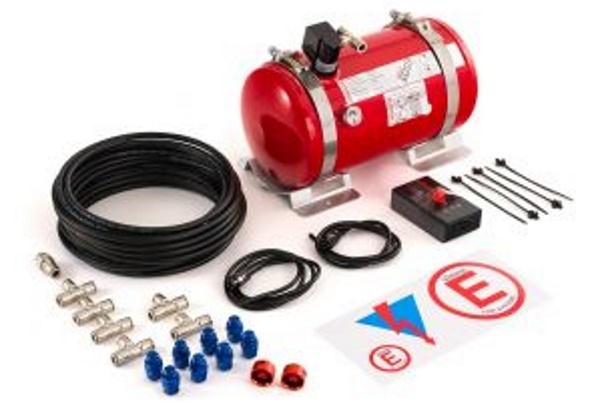 Plumbed in fire extinguisher systems consist of; a tank, tubes, nozzles and a trigger. These systems can be activated from both within the cabin and externally. When do I need a plumbed in fire extinguisher system? Where the vehicle is entered in a national or international rally eg: Australian Rally Championship or World Rally Championship event. Where the vehicle is manufactured in the year 2000 or later and is entered in state championship events. Unlike hand held extinguishers, plumbed in systems must be tagged and tested every two years. This is because plumbed in systems use a different principle and need more regular checks. To certify the tanks they must be drained, pressure tested and refilled to the manufacturer specifications. The work to test and tag a plumbed in system must only be carried out by the manufacturer or an authorised agent. In most cases a local fire extinguisher company is not qualified or authorised to test these systems. We generally have to freight a tank to an interstate agent to have it serviced when due. It will depend on the brand as some can be serviced by local agents. If your plumbed in system is electrically triggered, it’s worth changing the battery every 6 months. Pull type or mechanical systems do not require batteries. In the 2019 fire extinguisher rules the dates for plumbed in systems are to be recorded in vehicle log books. Often the tag on a plumbed is system is a sticker on the tank and due to the hard mounting it can be difficult to access and read. This new rule will make it much easier for scrutineers to reference test dates and tags. With the 2019 Motorsport calendar due to kick off soon, now is the time to have a peak under the car cover. A quick check now could save you a world of grief come race day.